Taize (pronounced tay-zay) is a contemplative, mediative prayer service which originated in the monastic community in Taize, in southeastern France. The service includes simple, repetitive chant, scripture readings and periods of silence. It is peaceful, regenerative and relaxing. 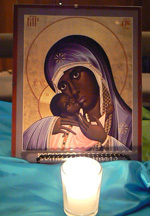 Taize is celebrated once each month on a Sunday evening at one of five churches in the Pleasant Hill/Walnut Creek area, including Church of the Resurrection. Contact the parish office for the current schedule.